Accessoires d’hygiène beauté en pharmacie PLIC : qualité et innovation pour le bon geste beauté femme, homme, et bébé. PLIC : quality, price, soft touch finish, color and beauty tips! PLIC is a new range of beauty accessories that stands out and shows off! PLIC: products of premium quality and perfect finish. 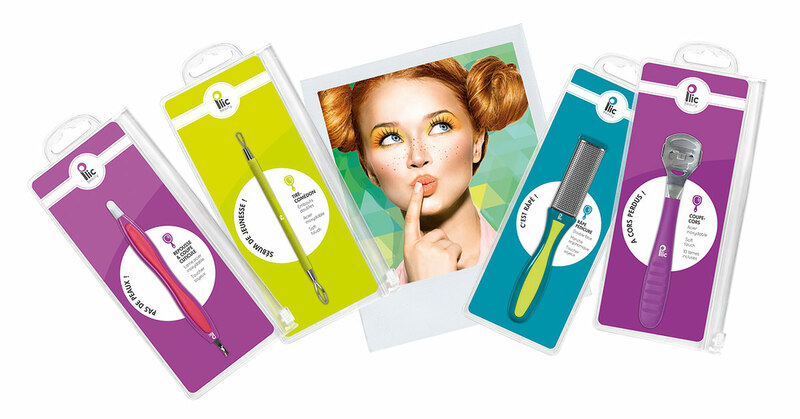 “In”, “fun” and colorful, PLIC beauty accessories are presented in convenient and unconventional packaging. Who said beauty was just a detail? Certainly not PLIC followers! The new beauty accessories range was launched by Horizane Santé in 2015. PLIC beauty already conquered the pharmacy channel and customers who enjoy beauty and design, convenient and nice essential beauty accessories. PLIC, a complete range of top quality beauty accessories for the whole family: women, men and kids. PLIC is not only a punchy, colorful and eye-catching range but also an energetic and original one. PLIC is fun and brings modernity to beauty accessories! You’re right: PLIC puts beauty accessories and cutlery under a bright new light in pharmacies! PLIC, a brand new range of beauty accessories in pharmacies. – Nail-clippers, scissors, nail files, cuticle-nippers: manicure and pedicure beauty accessories to make your nails look great on your hands and feet. – Ceramic pedicure graters, corn and callus remover: they will take great care of your feet and make sure you can show off at home or on the beach! 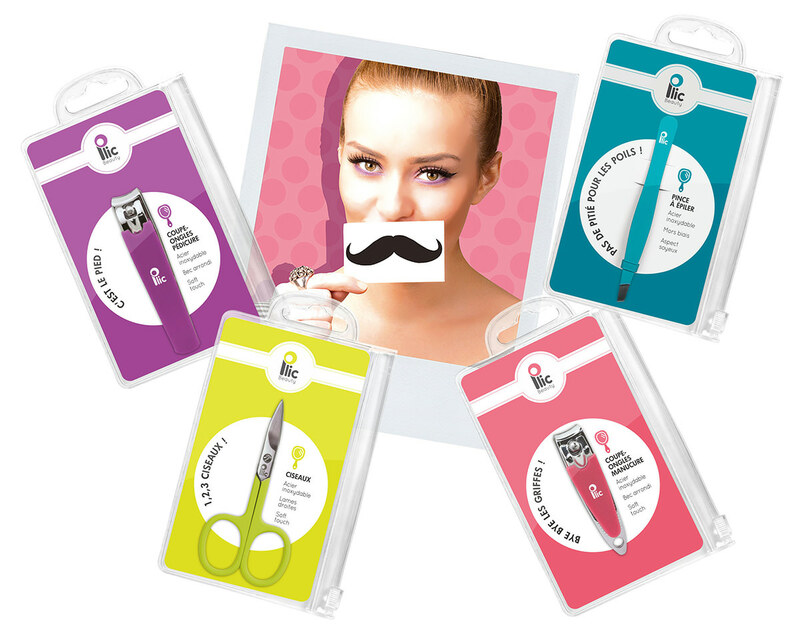 – Crab tip, straight tip and slant tip tweezers: they will help you to get a perfect and smooth skin. You will feel great! – Ear-pick, blackhead remover, splinter tweezer: those are specific beauty accessories that you often find at your beauty therapist and sometimes at home. 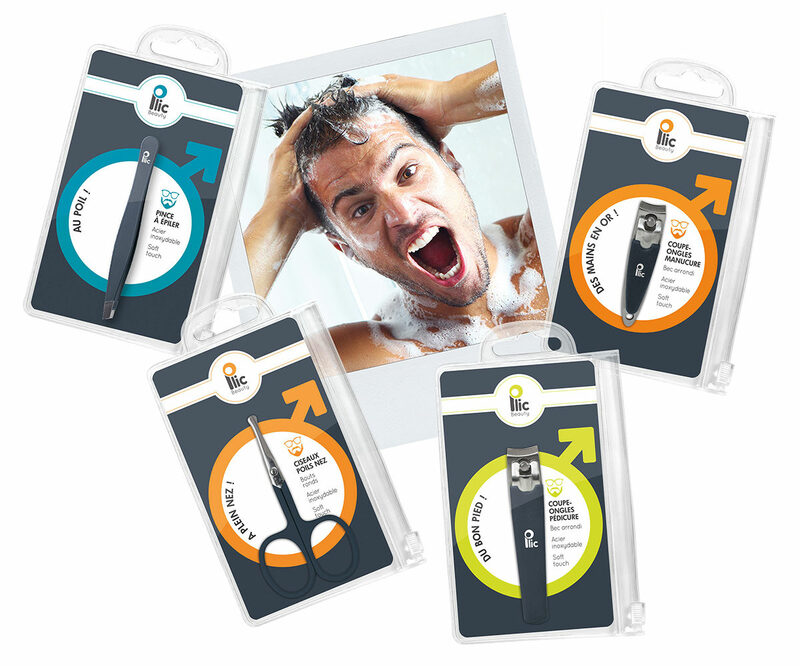 – Tweezers, scissors, nose hair scissors for men: a complete range of beauty accessories for men to look good! – Rounded tip baby nail scissors, nail files, nail clippers: even babies have their beauty accessories for mums to safely groom their nails! PLIC, a range of beauty accessories that clearly stands out of the way! Pink tweezers, Anise green nail clippers, Turquoise blue nail files, purple pedicure graters, pastel pink and blue baby nail scissors, dark blue scissors for men: PLIC beauty accessories will color your day! With PLIC, it is easy: let’s forget about metal look old fashioned beauty accessories and let’s choose a fun, up-to-date, colorful and funky beauty kit! Your friends will desperately be eager to borrow yours! It’s cute, eye-catching, of top quality, with great finish and very efficient! You don’t buy a pair of tweezers to find out it is not working properly (it does happen, believe us!) or for it to rust after a few days. PLIC beauty accessories developed a complete range of products made with professional quality materials so that anybody could use top quality beauty accessories. – All of our cutlery accessories are made with stainless steel. They perfectly resist damp and moist places such as bathrooms. – Our graters are made with real ceramic. Real ceramic is a hygienic non-porous stone: it doesn’t hold impurities and dead skin. It also perfectly fits persons with diabetes as there is no risk of injury at all unlike metal graters. – Nail files are made with strong and shiny «cristal de bohème»: beauty accessories will last much longer. – Silicone or rubber “Soft touch” finish brings two main advantages: accessories are soft and smooth and easier to grab and use. PLIC, an original and convenient packaging! PLIC, ultra-convenient zipped cases you can use again and carry in your handbag. You will be happy to find many beauty illustrations and advices printed inside the cases. – How should you file your nails? – How should you tweak your eyebrows? – How should you groom your feet? Useful funny and unconventional beauty advice so as to say: “PLIC beauty accessories will boost your spirit!”.